With the king day, ambitions rise. Play the Game of Thrones, work your way, rule the kingdom or serve the babe. Remember In the Game of Thrones, there is no middle ground, you win or you die. This Role Play will be set in King's Landing, the capital of Westeros. You may play your part no matter the size or nobility, as it is a time of chaos. When the Throne room was shut and the blood bath began, the dragons seem to have sensed it. 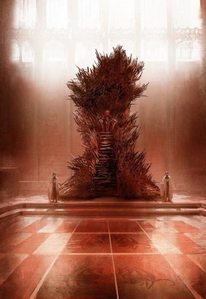 King's Aerys dragon Vermithor burst out of the Dragon pit and flew straight into the throne room breaking past the door. It is said that the Dragon was mad seeing the dead body of its master, it burned the everybody till all that was left was just smoke as ashes. Dragons, 30 Moons, 210 Stags or 11,760 pennies. The coins most commonly encountered are: Half-Pennies, Pennies, Stars, Stags and Dragons; rarely does anyone have the change on levels between.